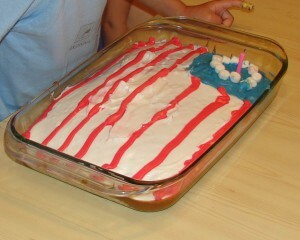 Colonial flag cake we made a couple of years ago. Fun question to ask your family on July 4th: How many of the original 13 colonies can you name? If you need a fun family movie to watch over the holiday, might I recommend Pollyanna (the Disney version with Hayley Mills)? I always think about it on the 4th of July because of the bazaar where Pollyanna dresses up as part of the flag and they sing “America the Beautiful.” It also teaches wonderful lessons about being choosing to be “glad” in any circumstance. And wherever does she get that crazy idea? From her father’s study of the Bible as a missionary. I love it. This entry was posted in Uncategorized and tagged family song, home, life with little ones by Charity Hawkins. Bookmark the permalink. We just watched Pollyanna tonight! That is a good 4th movie.